Summary: Discover the what, why, and how of Biblical baptism. Baptism is a crucial part of the Christian life. Not only was Jesus baptized as an example to us, but He also strongly admonished His people to be baptized and to baptize others. 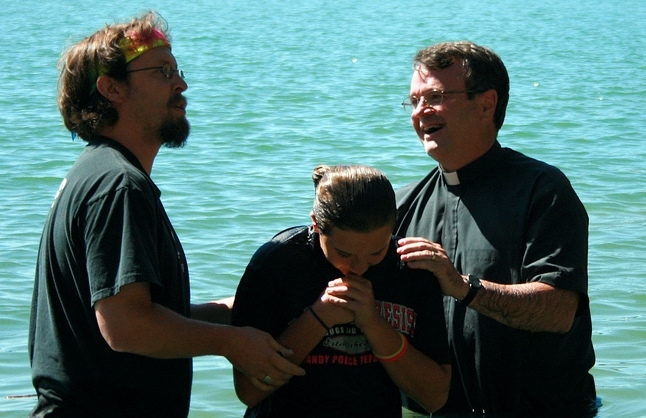 A woman is baptized by immersion at a Lutheran camp. In one of Jesus' last conversations before He ascended into heaven, He told his friends to “go and make disciples of all nations, baptizing them...and teaching them to obey” (Matthew 28:19-20 NIV). Go into all the world and preach the gospel to every creature. He who believes and is baptized, will be saved; but he who does not believe will be condemned (Mark 16:15-16 NKJV, emphasis added). Whoever commits sin also commits lawlessness, and sin is lawlessness (1 John 3:4 NKJV). The law of the LORD is perfect, converting the soul: the testimony of the LORD is sure, making wise the simple. The statutes of the LORD are right, rejoicing the heart: the commandment of the LORD is pure, enlightening to the eyes. The fear of the LORD is clean, enduring for ever: the judgments of the LORD are true and righteous altogether. More to be desired are they than gold, yea, than much fine gold: sweeter also than honey and the honeycomb. Moreover by them is thy servant warned: and in keeping of them there is great reward (Psalm 19:7-11). It is not enough to have a theoretical knowledge of the law. Keeping the law just because we know it is right is legalism. The law must be kept from the heart. It must become part of our character. Only then will we be able to reflect the love of Christ to a world in need. Returning to Mark 16:16—"He who believes and is baptized, will be saved"—we can now understand the full significance of the word "baptized.” Baptism is the symbol of the changed life. It is the symbol of rebirth, a demonstration of the death of the old sinful person and the resurrection of the transformed person, who lives in harmony with the law of God. Baptism is the symbol of restoration. And be not conformed to this world: but be ye transformed by the renewing of your mind, that you may prove what is that good, and acceptable, and perfect, will of God (Romans 12:2). Until we are touched by God’s grace and the workings of His Spirit, it is impossible to obey Him. It is the Spirit of God that enables us to live in harmony with the will of God. Because the carnal mind is enmity against God: for it is not subject to the law of God, neither indeed can be. So then they that are in the flesh cannot please God (Romans 8:7-8). Most assuredly, I say to you, unless one is born of water and the Spirit, he cannot enter the kingdom of God (John 3:5, NKJV). The Holy Spirit works inside us to transform us into people who reflect the character of Jesus. The water—baptism—is the outward symbol of our willingness to accept the transformation process. Obedience to God comes as a gift from God. Both justification and sanctification are gifts we receive through faith in the Son of God. Justification is the legal side of our relationship with God. We are declared innocent, even though we are guilty, because Christ paid the penalty for our sins. Sanctification is the active side of our relationship with God. It is the little-by-little, daily process of the Holy Spirit making us more like Him. We did nothing to deserve either of these gifts. Our job is to accept them. ...he saved us, not because of righteous things we had done, but because of his mercy. He saved us through the washing of rebirth and renewal by the Holy Spirit (Titus 3:5 NIV). Wherefore by their fruits, ye shall know them (Matthew 7:20). Behold, the days come, saith the Lord, that I will make a new covenant with the house of Israel and with the house of Judah; not according to the covenant that I made with their fathers in the day that I took them by the hand to bring them out of the land of Egypt, which My covenant they brake, although I was a husband unto them, saith the Lord. But this shall be the covenant that I will make with the house of Israel after those days, saith the Lord: I will put My law in their inward parts, and write it in their hearts; and I will be their God, and they shall be My people (Jeremiah 31:31-33 emphasis added). Baptism is the outward symbol of rebirth, but is also the outward sign of entrance into the body of Christ—His Church. For by one Spirit are we all baptized into one body, whether we be Jews or Gentiles, whether we be bond or free; and have been all made to drink into one Spirit...ye are the body of Christ (1 Corinthians 12:13,27). A teenager hugs her mom after being baptized in the ocean. Those who accept Jesus are not just choosing to follow Him by themselves. Following Christ means becoming part of the Church. If by being baptized we demonstrate our acceptance of the covenant relationship with God, then we also become a part of the covenant people of God. So we, being many, are one body in Christ, and every one members of one another (Romans 12:5, see also 1 Corinthians 10:17; Colossians 3:15). For as the body is one and hath many members, and all the members of that one body, being many, are one body, so also is Christ. For by one Spirit are we all baptized into one body…For the body is not one member by many. But now are they many members, yea but one body (1 Corinthians 12:12-14, 20). There is one body and one Spirit, even as ye are called in one hope of your calling (Ephesians 4:4). The true body of Christ teaches obedience to God's commands and has faith in the transforming power of the Holy Spirit. One cannot be baptized and live apart from the Church. That would be like an organ trying to exist outside the body. God has always worked through His organized Body, the Church. Even Christ worked within the organized Body of that era: the people of Israel. When we are baptized, we enter into a covenant relationship with God. The promises He made to His people become applicable to us. One of those promises is the gift of the Holy Spirit. If ye love Me, keep My commandments. And I will pray the Father, and He shall give you another comforter, that He may abide with you forever - the Spirit of truth, whom the world cannot receive, because it seeth Him not, neither knoweth Him; but ye know Him, for He dwells with you, and shall be in you (John 14:15-17). Repent, and let every one of you be baptized in the name of Jesus Christ for the remission of sins; and you shall receive the gift of the Holy Spirit. For the promise is to you and to your children, and to all who are afar off, as many as the Lord our God will call (Acts 2:38-39 NKJV). The promise of the Holy Spirit is given to those who believe and are baptized. It is conditional to repentance and obedience. ...the Holy Spirit whom God hath given to them that obey Him (Acts 5:32 emphasis added). Know ye not, that so many of us as were baptized into Jesus Christ were baptized into his death? Therefore we are buried with him by baptism into death: that like as Christ was raised up from the dead by the glory of the Father, even so we also should walk in newness of life (Romans 6:3-4 emphasis added). Even the ability to repent and obey is a gift from God. It is the Holy Spirit Himself who is sent to “convict the world of sin, and of righteousness, and of judgment” (John 16:8 NKJV). So baptism is not just accepting the forgiveness of Jesus, it is accepting the transforming power of Jesus to help us repent and obey in the first place. In baptism, "our old man is crucified with him, that the body of sin might be destroyed, that henceforth we should not serve sin" (Romans 6:6). Baptism is the sign of the death of our selfish, sinful nature. That old, worldly person is buried in the waters of baptism. 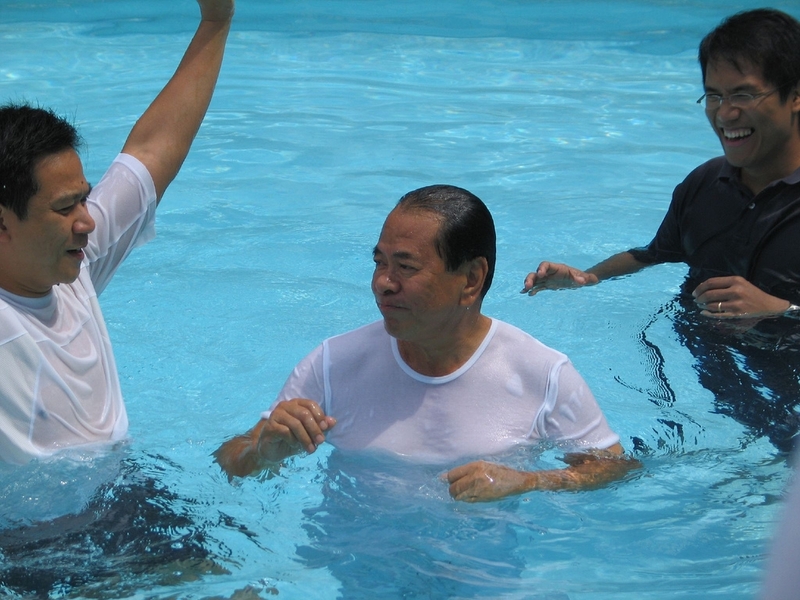 A baptism by immersion is celebrated in the Philippines. And those who are Christ's have crucified the flesh with its passions and desires. If we live in the Spirit, let us also walk in the Spirit (Galatians 5:24-25 NKJV). Know ye not, that so many of us as were baptized into Jesus Christ were baptized into his death? Therefore we are buried with him by baptism into death: that like as Christ was raised up from the dead by the glory of the Father, even so we also should walk in newness of life...Knowing this, that our old man was crucified with him, that the body of sin might be destroyed, that henceforth we should not serve sin (Romans 6:3-6). Not by works of righteousness which we have done, but according to His mercy He saved us, through the washing of regeneration and renewing of the Holy Spirit (Titus 3:5 NKJV). For the sinful nature desires what is contrary to the Spirit, and the Spirit what is contrary to the sinful nature. They are in conflict with each other, so that you do not do what you want...But the fruit of the Spirit is love, joy, peace, patience, kindness, goodness, faithfulness, gentleness and self-control. Against such things there is no law (Galatians 5:17,22-23 NIV). The seventh-day Sabbath was instituted to commemorate Creation (Exodus 20:8-11; 31:17). It also served as a reminder of God's restoring and saving work in our lives—a reminder that these things cannot be accomplished through our own works (Exodus 31:13; Hebrews 4:10). We rest on the seventh day to honor our Creator and our Saviour. However, many Christians defend Sunday as the day for worship on the grounds that they are celebrating Christ's resurrection from the grave after His death on the cross. Baptism is, among other things, our own participation in Christ's death, and our own resurrection to a new life in Christ. When we are submersed under the water, it is a sign that we are choosing to let our old life die. And when we rise from the water that symbolizes a watery grave, we are choosing and receiving on a daily basis a new life in Christ—trusting in the merits of Christ to save us, and choosing to daily slay the old selfish desires that fight against Christ's principles. The new birth experience celebrates Christ's resurrection by applying the power of His resurrection to our lives through our own choice. Now that we've learned the "why" of baptism, discover what Scripture and Christians throughout the ages have to say about the "how"